The Mk.5 is probably Brenell's most famous model. 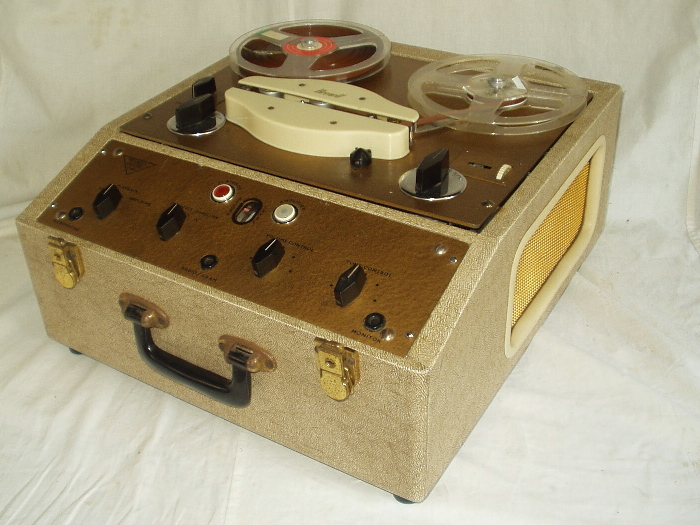 Launched in April 1958 with a gold 'hammered enamel' deck plate and mushroom-beige 'Rexine' covered plywood cabinet it inherited a much improved version of the Mk.4 deck incorporating features which were standard on the domestic 3-Star, such as a digital tape counter and on-demand three-speed selection. It however retained the 1/2" and 1" capstan sleeves making this a belt-less, on-demand four speed machine. Only by placing a Mk.4 and Mk.5 deck side by side, are these differences made obvious: no lapsed-time plate, speed selector on left, tape counter on right, pull down non-locking pause control, and new Bulgin black plastic, rhomboid shaped control knobs on both deck and pre-amplifier. Hidden under the ivory head covers was a new, separate, head block which greatly reduced assembly and head alignment time. 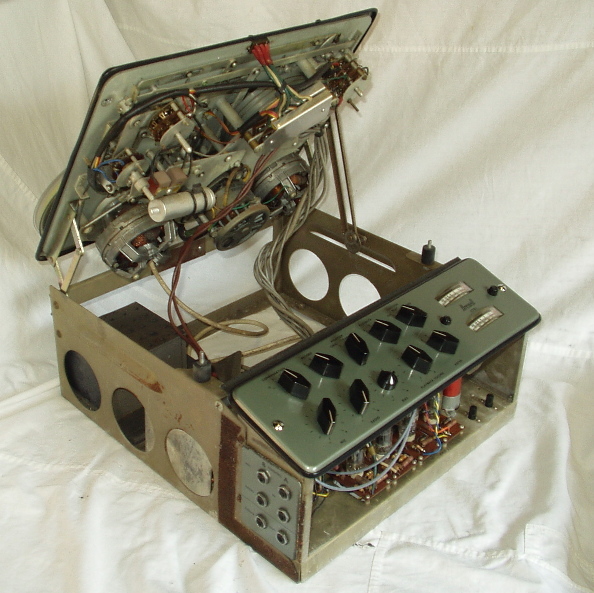 The standard Mk.5 used a Brenell erase and a combined Brenell record/playback head, but space allowed the experimenter to fit a further two heads. There are in fact four variants. Early examples employed a right hand tape back-tension arm and brake with BT-H 1103 motors; this was soon upgraded to an AEI 1303 synchronous capstan motor at which the back-tension arm became an anti-flutter arm; it was finally removed when triple AEI 1303 hysteresis synchronous were fitted. In its final form it adopted a Papst hysteresis synchronous main motor with AEI spool motors and is easily identified by its new black plastic head covers. 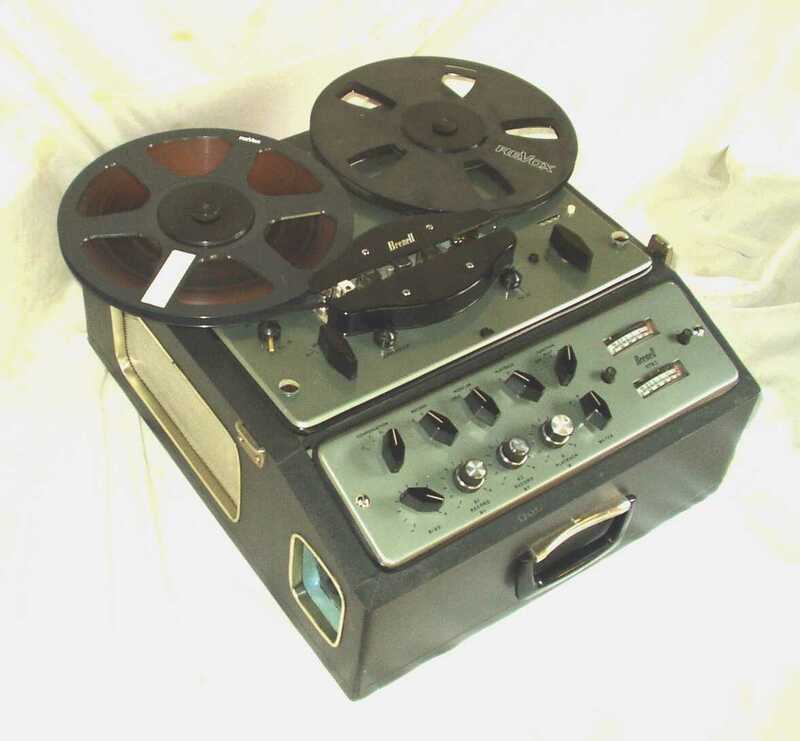 The Mk.5 was a truly versatile deck with its four speeds and provision for four heads; it soon became the envy of enthusiasts in the many competitive tape-recorder clubs which grew rapidly across the country as tape-recording gained momentum. Many found that by varying the size of the capstan sleeves, it was possible to create unique pitches and soon Brenells were being used experimentally by Daphne Oram, who pioneered the BBC's Radiophonics Workshop, using several Brenell Mk.5 mono and the new staggered stereo decks in her own workshop. The Mk.V staggered stereo was first offered in the summer of 1958 and employed a pair of staggered stereo erase and record/playback heads which allowed reproduction of the commercially made American staggered stereo tapes. Incredibly, modern stacked-stereo remained very much a domestic novelty for many years as professional musicians preferred a full bodied mono. The deck was mounted atop a large steel frame with twin pre-amplifiers on a steeply inclined front panel; it was very heavy! Initially of 8-1/4" capacity, it was soon joined by a 10-1/2" model in which the spool motors were positioned nearer the corners. As the spool turntables retained the DIN 3-wing drive, a new three piece DIN/AEG/NAB centre was supplied to allow DIN, NAB or the original AEG centre 'pancake' open reels, much favoured on the continent. With the introduction in 1961 of the new Papst motored, 'grey' Mk.5M ('M' for 3-head monitor), the 'gold' Mk.5 remained on offer for year with an optional valve voltmeter (replacing the record level indicator); it was briefly offered in a new blue-grey hammered enamel finish. 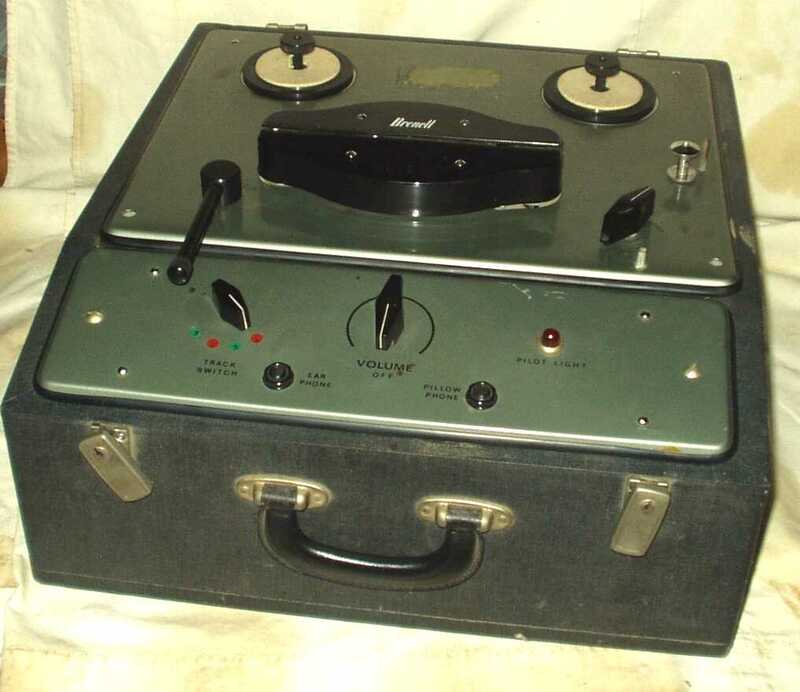 The Mk.5M initially adopted Brenell's erase and record head but with a third Bogen monitor/replay head (there was still space for a fourth head), plus a valve voltmeter peak recording level meter pre-amp. 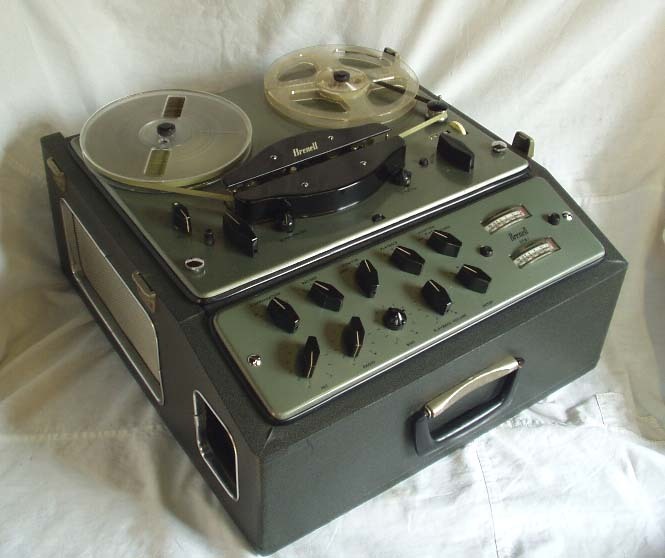 It was technically a Series 2, but not known as such (it is seen here right in later Series 3 form) even though it used a re-engineered Mk.5 deck finished in a blue-grey paint, now covered by a large removable alloy masking plate - a theme carried over to the remodelled pre-amplifier panel: initially in dove-grey enamel, it soon changed to a leather-grain effect on the improved all-Bogen head models. Unfortunately access to the deck innards was now hampered by the mask requiring removal of all the control knobs and mask to gain access to the deck release screws! The tape deck was fitted into a lower profile cabinet, trimmed in a mid grey 'Rexine' elephant-hide effect material similar to that used by Land Rover for their seats! AEI spool motors and a Papst main motor were retained and, in addition to the pause control, there was a new pull down 'superimpose' button which eased the tape away from the erase head to allow over-dubbing - it was not perfect, but with the Mk.5M's additional ability to mix microphone and radio inputs, the Brenell's versatility was greatly enhanced especially with the new Bogen head array from 1962. Curiously, though the deck plate is punched for a lockable pause control, Brenell decided early into production that it was perhaps not such a good idea if an errant user left the machine in that state, so the masking plate was modified to blank off the lockable 'dog-leg'. The Mk.5M was joined in 1962 by the new Mk.5 - now officially the Series 2 - which shared the same cabinet and 'grey' theme, but had a more basic Bogen 2-head configuration and simpler pre-amplifier with a central side-on level indicator. Like all previous Brenells, the pre-amplifier had an output stage for the internal speaker which, with a standard Lustraphone LFV59Z microphone, could be used for public address. With the arrival of the new model Mk.5 Series 2, the Mk.5M duly became the Mk.5M Series 2: the 10-1/2" models were now officially Mk.510. In 1963 a new Series 3 deck appeared. This was re-engineered to accommodate Papst spool motors, with their rim brakes, heavier flywheel and now with improved Bogen Universal heads; such modifications set new professional standards in wow and flutter and frequency response. These Series 3 models are immediately recognisable by their large black plastic spool turntables and, on cabinet fitted models only, by two large chromed thumb screws which on their release allowed the deck to be raised on its rear hinge without having to remove the masking plate and knobs! Brenell had already produced some special purpose decks based on the Mk.5, such as the staggered stereo. Their willingness to help tape-recorder enthusiasts led to a specially modified replay deck for use by patients in hospitals. Fitted with an extra long (and much easier to operate) play control lever (the photo shows it incorrectly fitted), it allowed patients to listen to "spoken books" from the Hospital Library Service. These used a non-standard tape width and a unique playback speed to prevent unauthorised home recording. There was even an experimental two-way recording reverse deck as well as data recording and tape-loop echo decks. However the most significant development was the new STB1 which appeared in 1963. This was an astonishingly versatile and mind bogglingly complex model. 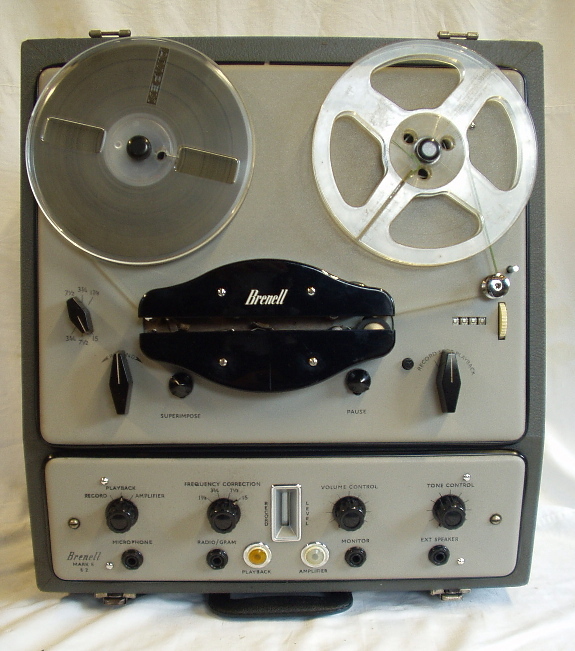 For some time now, a Brenell had become the experimenter's machine of choice (the Beatles had Brenell Mk.5s) but with demand for stereo growing, Brenell recognised that musicians were in urgent need of an affordable stereo mastering deck with basic monitoring and mixing facilities, for which Brenell had offered a basic, single channel microphone/radio mixer. Yet they still did not offer a standard, off-the-shelf stacked stereo model: the short lived, domestic 3-Star and the heavy, industrial Mk.5 stereo had long since been dropped. They now developed a new stereo pre-amplifier with twin edge-on meters for the enthusiast to use in conjunction with a Mk.5 fitted with the optional stereo heads. 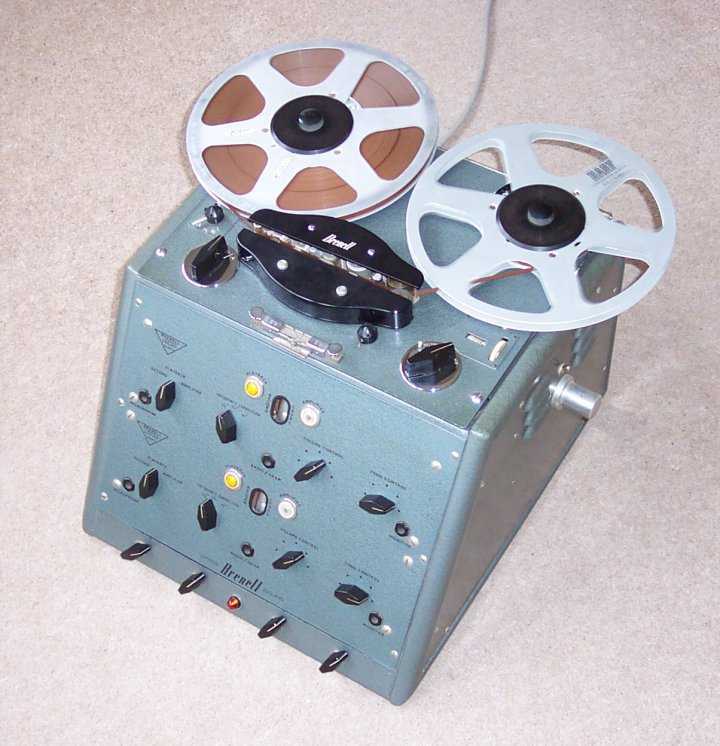 Brenell called this a 'Tape Link' ( bottom ) as it literally linked a stereo recorder to an external stereo amplifier; it was developed from the stereo pre-amplifier for the new STB1. 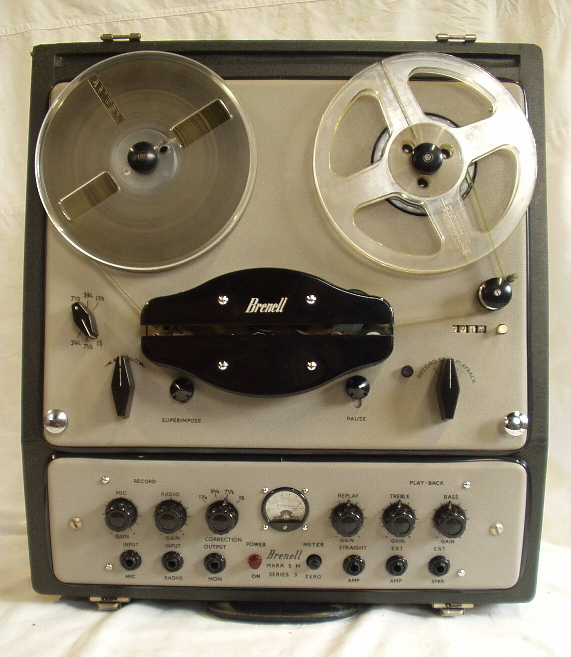 The Mk.5M Series 2 was the ideal platform for Brenell's first 'professional' deck, the STB1, launched in 1963. It had an additional manually applied rewind spool brake to ensure more consistent high-speed spooling with minimal tape-edge damage. But of far greater importance on the standard 1/2-track STB1 was a fourth 1/4 track replay head selected by a slide-switch (likewise for 1/4 track STB1). In conjunction with this, up to 10-1/2" capacity, full frequency equalisation correction and four speeds, it was possible to work with virtually any tape format and configuration. The new stereo pre-amplifier allowed full sound-on-sound, echo, track transfer, mixing facilities and variable bias levels. It was a truly awesome machine with enough knobs to impress even the most enthusiastic school-boy, but its mind boggling complexity required mastering new skills and a very cool nerve - especially as it was not easy, for instance, to set different recording levels for each track. At the side of the cabinet was an aperture for the 1/4" input and output jack plugs. The entire deck and pre-amplifier were fitted into a self-contained steel cage which could be console mounted or slid into the back of a specially modified Mk.5 cabinet/flight case. It adopted a new polychromatic metallic green enamelled finish and cost £120, almost twice that of the basic Mk.5, but even at this price it was considerably cheaper than a basic professional studio model. A 10-1/2" model was also available as was a 1/4 track model with 1/2 track replay head. Launched as the STB1, Brenell appears to have anticipated a Mk.2 and sure enough in 1964, following Brenell's relocation to a new factory in Liverpool Road, London, a much improved STB2 appeared with the new Series 3, all-Papst deck. This was even more awesome with extra mixing facilities and now engineered to 600ohm studio standards with each input and output capable of being configured for virtually every conceivable piece of equipment: it at long last had concentric track gain controls! It was also slightly longer than the STB1 to accommodate an optional stereo valve output amplifier in the rear of the chassis and, with optional built in stereo speakers, it became a truly versatile mini-recording studio, prompting Brenell to expand further into the fledgling musician and home studio market. The separate stereo 'Tape Link' pre-amplifier remained available offering basic record and playback functions with upper and lower track monitoring facilities. As with the STB, it was finished in a polychromatic metallic green enamel with a substantial cadmium plated steel case designed for slotting into a standard Brenell cabinet or studio console.